This is the church that Midrash Little Rock will be connected with. If you’re a fan of Midrash Little Rock you should come on out and grab some food, a tasty beverage of your choice, and hang out with us. i’m excited to announce our upcoming spectacle/shindig/gathering (it’s your choice of the 3 words…we’re all about free will at eikon…) for august. 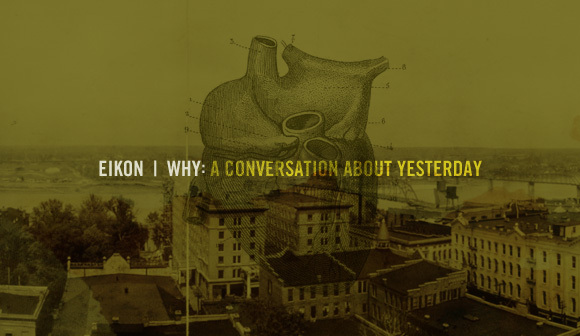 on sunday, august 30, at 6 p.m., we’ll be hanging out at the house—the great new addition to hillcrest—engaging in a conversation that we’re calling EIKON | WHY: a conversation about yesterday. why is it a conversation about yesterday? 1. we like to use really intriguing-yet-bordering-on-pretentious titles for our gatherings. 3. (seriously), we’re all experts on yesterday. we just lived it and need to process it. knowing the what of our past speaks to the why of our present/future. 4. we think your yesterday story is probably much closer to others’ stories than you think and thus, closer to the story of why we’re starting this thing called eikon. ok, well, we are now equally confused and intrigued. how about yourself? in the event that you find yourself confused and/or intrigued, you should definitely come hang out with us on sunday, august 30 at the house. our conversation about why we’re starting eikon will be a great entry point if you couldn’t make it to our gathering at vino’s last month and likewise, a great conversational entry point for those who have already been hanging out with us. here’s the quick minutiae of the gathering. try to be there fairly close to 6 p.m.. we’re working with the chef to create a special menu for us that will give you a choice of 5 entrees and your choice of any of their beverages (beer, wine, coffees, soft drinks). just to be clear, eikon isn’t picking up the tab, but we think you’ll find the menu reasonably priced (and well worth it). instead of the usual ordering downstairs, go ahead and come upstairs, grab a seat and they’ll do service at the tables. we’ll spend the first hour just eating/drinking and hanging out. we’ve reserved a small room to the right upstairs, but during the first hour of dinner, feel free to sit anywhere upstairs. around 7 or so, we’ll transition into our conversation into the smaller room (where people might have to squeeze in, stand, lean, squat or engage in other means of fitting a large mass into a small space). my (ryan) goal is to talk a little and listen a lot (though I can often be more successful in the reverse scenario…). i’ll intro the conversation and serve as a guide, but my hope is that the conversation will revolve around the group rather than myself.